This was billed to be a potential title-decider and the champions made sure that there would be no doubt as to which team has the momentum right now. Most people had Week 20 in the Division 1 Féminine circled as the week that would see which team could go on to win the title. The top of the table clash was probably the most viewed match this weekend but at the bottom of the table, there is still much to be played for in the relegation battle. Paris Saint-Germain came into their match away in Lyon with all the momentum after Olympique Lyonnais' uncharacteristic stumble in Week 19 but they simply had no answer for the force that is OL in full flight. Ada Hegerberg drew level with Marie-Antoinette Katoto in the race for the top goalscorer this season with the first goal of the match in the eighth minute. Hegerberg was picked out magnificently by Amandine Henry and the Norwegian rose highest to nod home her 18th goal of the season. PSG had no response to that early goal and were undone once again in the 40th minute by some great play by OL. Jessica Fishlock picked out Eugénie Le Sommer with a great ball and the French international lifted the ball over the goalkeeper for OL's second. Wendie Renard then made PSG's task even more difficult in extra time at the end of the first half after Ève Périsset gave away a penalty with a handball. The second half continued on as the first half with OL completely dominating proceedings. 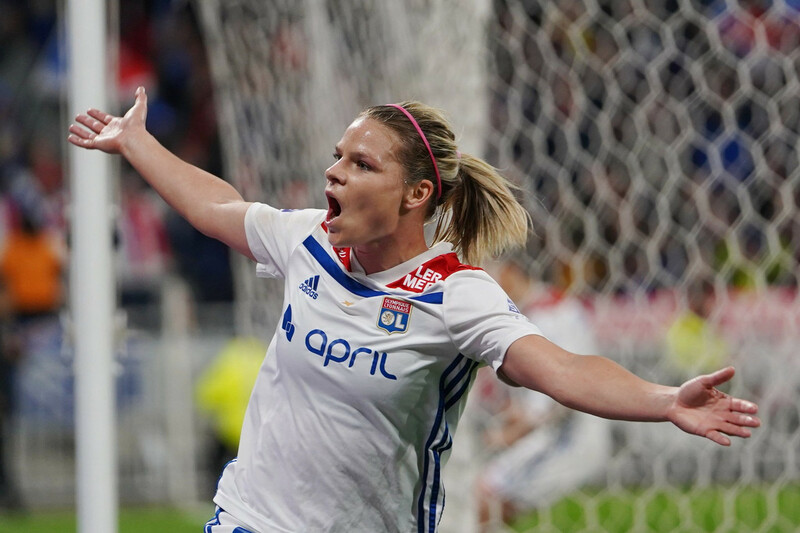 Hegerberg turned provider in the 60th minute when she slipped in Dzsenifer Marozsán who finished low past the goalkeeper and Shanice Van de Sanden wrapped things up when she raced onto a long ball and fired past the goalkeeper in stoppage time for OL's fifth and final goal. They do not come any better than this when it comes to statement performances during a title race. Many thought that this game would be a tight, tense affair but OL had other ideas and PSG had none. PSG were flat throughout the 90 minutes and defensively, were shocking for a team of their calibre. With only two more matches to go, OL are three points ahead at the top of the table and PSG will have to pray for a miracle to give them any chance to win the title. If people were shocked by the result at the top of the table then they may have felt the need to check their eyes when they looked at the final score between Rodez AF and Montpellier HSC. Rodez, who up until this weekend, had only managed two wins all season and were facing relegation found enough in themselves to scrap and gain three points against a Montpellier that had been rolling. Both teams had chances early on in the game but it was Flavie Lemaitre who opened the scoring in the 38th minute. The Rodez forward held off a defender before firing beneath the advancing goalkeeper to give the hosts the lead in the first half. Montpellier drew level again in the 51st minute when Valérie Gauvin held up the ball well inside the area before turning and placing the ball beyond the goalkeeper's reach. Many expected Montpellier to push on from there but it was Rodez that got the winning goal. Miscommunication between Anouk Dekker and Casey Murphy allowed Kimberley Cazeau to sneak and roll the ball into an empty net, sending her teammates into wild celebrations. This is not the first time that Rodez have managed to pull off an unbelievable result but at this point in the season, with only three points now separating themselves and the team above the relegation zone, every point is vital. Montpellier will be disappointed with their approach to this game. They did not trouble Rodez' backline as much as they should have and they paid the price for their lack of intensity. They now sit in fourth and continue to have an inconsistent season. FC Girondins de Bordeeaux picked up another result to keep their outstanding season going. The hosts left it very, very late against Lille OSC but they managed it all the same and got their tenth win of the season. Lille got the first goal of the game in the 23rd minute when Carla Polito when her cross from a long way out drifted in the air and landed in the far corner of the goal, over the goalkeeper's outstretched hand. Viviane Asseyi made the game one-all in the 39th minute after a scramble inside the area during a corner kick allowed her to slide the ball home from close range. The second half saw Bordeaux push for a winner but they had to wait until deep into stoppage time to get it. A long ball over the top saw three Bordeaux players played onside and Asseyi unselfishly squared the ball to Claire Lavogez who finished into an empty net. Lille will feel hard done by with this result as their appeals for a handball earlier in the second half were waved away by the referee. They remain in the relegation zone but still have a chance to change their fortunes as they are only one point away from safety. Bordeaux move into third after their win and will be content to see out the season in that position. Dijon FCO needed to start picking up points again to stop their slide down the table and managed to do so against FC Fleury 91 in Week 20. Elise Bussaglia scored a remarkable opener in the 23rd minute when her corner kick was deemed to have crossed the line despite goalkeeper Blandine Joly easily catching the floated ball. Despite Fleury's appeals, the goal stood and gave Dijon the lead. Dijon continued to create chances for themselves and got their reward in the 52nd minute when Lindsey Thomas sent her marker the wrong way before tucking the ball into the near post. Julie Machart-Rabanne scored an 87th minute goal for Fleury but by then it was too little, too late for the visitors. Neither Dijon nor Fleury are in any real danger of being dragged into the relegation battle but each point will be welcomed by either team as they look to cement their place in the top division for next season. Dijon move into eighth with this result and are at least six points clear of the bottom two sides. Fleury move down into seventh but they too are a respectable distance away from the bottom places. FC Metz' downward spiral continued this weekend with a one-nil loss at home against Paris FC. The only goal of the game came in the 67th minute when Gaëtane Thiney took advantage of some shambolic defense by Metz to take the ball past a few players before placing the ball beneath the advancing goalkeeper for the lead. Metz had opportunities to score a goal of their own but could not find the finishing touch they desperately needed. Metz have now lost four games in a row and find themselves sweating over their top flight future with only one point separating them from Lille in eleventh. Paris remain in fifth but with a second win in a row, will feel much better about their performances of late. En Avant de Guingamp will have to wait another week before making sure of their safety in the top division for another season. They hosted ASJ Soyaux who came away with a one-nil win on the day. A fifth minute goal by Sarah Cambot was all that was needed on the day for Soyaux who got their second win on the bounce. Guingamp slide down into ninth and although they are five points clear of the relegation zone, will not feel entirely secure until they can pick up one more win. Soyaux move up into sixth and maintain their mid-table stance which has been there for most of the season.